Thank you for visiting TRUSS GENIUS, we offer a comprehensive lineup of custom aluminum truss solutions for trade show exhibits, motion capture systems, theaters, storefronts, races, nightclubs and more. Whether you’re planning an intimate outdoor gathering or a major exhibition, we’re here to answer all of your questions. Our customers enjoy superior service, expert advice, quality products and tailored solutions. Feel free to give us a call at (800) 376-1460. Our aluminum truss systems are designed for a variety of applications and can be used to support lighting, sound equipment, cameras, digital signs, and banners. Aluminum is a highly versatile, multipurpose alloy, and each series layout in our product line features a particular load rating. We even offer heavy-duty configurations for more structural support. Here are the key advantages of aluminum trussing. Trade Show Exhibit Display Booths, Truss Genius understands that every trade show booth and individual company expectations are different. We can help you design and create an entire experience that helps your visitors connect to what makes your business genuinely different and better than your competitors. Whether you’re looking for a whole Trade Show Booth or a simple truss display, we’re always ready to help. Truss Finish Lines, Aluminum Truss is a fundamental element of any professional sporting event. A Truss Finish Line is simply a must to begin the finish line is designed to make an electrifying statement. Participants want to see clear finish lines and at the moment of their accomplishment want to hear their names and have their photos taken. The modular design of Aluminum Truss allows portability and ease of set-up. Truss is a perfect solution for supporting time clocks, camera and film equipment, timing sensors, sound and lighting equipment. Let’s not forget about your sponsors. With the right design, we can provide the appropriate placement of your sponsor graphics. Let us help you create an exciting finish line for both spectators and participants by creating the right Truss Finish Line for your event. Truss Totems and Glow Totems, Given that some venues do not enable you with the ability to rig from their ceilings, Truss Totems give mobile entertainers capacity to provide modern and practical lighting solutions. Truss Totems are lightweight, easy to transport allowing them to be discreet and easily adaptable from venue to venue thus A Simplified Transportation and Professional Presentation. Glow Totems Consist of four single truss tubes, a base plate, a top plate, and a lycra truss cover, the Glow Totem kits include everything needed for DJ’s and mobile entertainers to create a clean, polished look. At weddings, Truss Totems become a classy way to hang Big Lighting Fixtures Vs. Lighting Stands. When the tubes are assembled, and a Battery Powered LED Uplight is placed at the bottom then covered with the lycra truss cover, there’s no cross-hatching only a smooth modern uplighting glow. Custom Powder Coating Get a durable finish that outlasts any paint job. Powder-coated aluminum is highly resistant to moisture, chemicals, and ultraviolet radiation. It’s the superior option for any outdoor display. Better still, you don’t have to worry about scratching, fading, corrosion, and other wear issues. Give us a call to talk about specific customizations. This is one add-on you don’t want to ignore. Whether you’re promoting a product, performing a play, opening a nightclub or anything in between, don’t just provide a presentation; create an experience. Call us today at (800) 376-1460. We’re happy to discuss all of our aluminum truss systems, and we’ll only offer extras that will benefit your display. 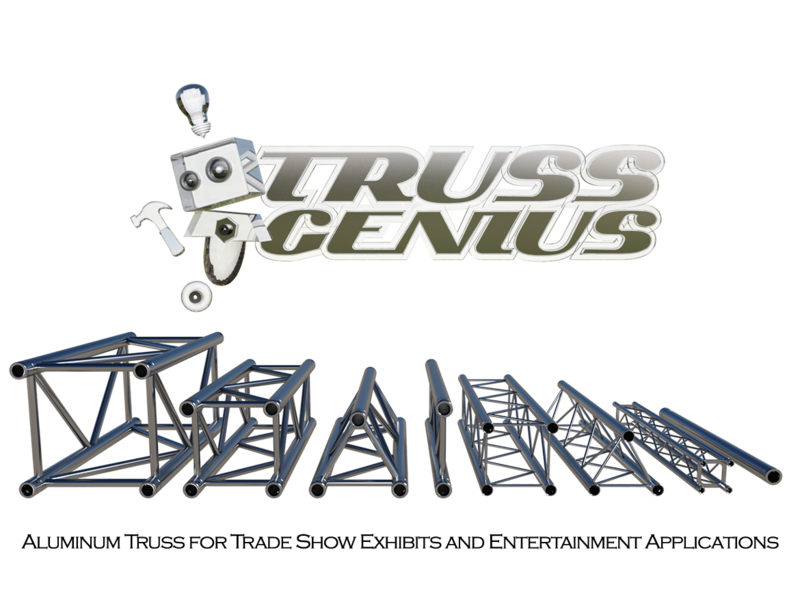 With TRUSS GENIUS, you enjoy safety, value and pure innovation. Stage Lighting Equipment Supplier in Rancho Cucamonga, California.